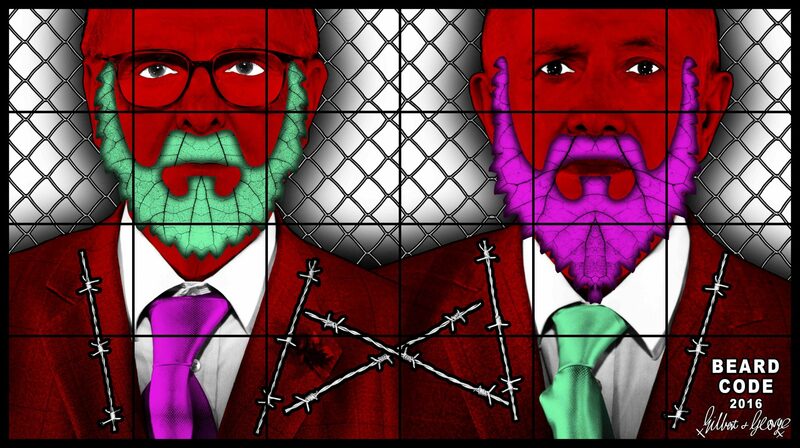 New York, November 28, 2018—THE BEARD PICTURES exemplifies Gilbert & George’s commitment to “Living Sculpture,” or an inseparable association between the world and their art. The pictures respond to the shifting demographics of our time, befitting the artists’ proclamation of “Art for All.” Viewers should not mistake this mandate for a democratic approach to art as a pleasantry. Taboos, fetishes, political upheaval, and the functions of the human body are some of the great unifiers of humanity, and Gilbert & George have long offered scathing and unsanitized views. The gallery will host a reception on Thursday, January 10, from 6 to 8 PM in Hong Kong, and 5-7 PM in Seoul. THE BEARD PICTURES are violent, eerie, grotesque, lurid, and crazed. They show a dream-like world of paranoia and destruction and madness … a world bereft of reason, in which negotiation no longer exists. Gilbert & George take their places within THE BEARD PICTURES as intense, red, staring, empty-headed, and sinister versions of themselves … THE BEARD PICTURES turn history into a mad parade, their mood shape-shifting between that of science fiction, lucid dreaming, and Victorian caricature … In this chaos of trashed aesthetics and reversed values, all has become symbol and surface: mad symbols, presented with deadly seriousness. Rachel Lehmann and David Maupin founded Lehmann Maupin in 1996. The gallery represents a diverse range of American artists, as well as artists and estates from across Europe, Asia, Africa, South America, and the Middle East. It has been instrumental in introducing numerous artists from around the world in their first New York exhibitions. Known for championing artists who create groundbreaking and challenging forms of visual expression, the gallery prioritizes personal investigations and individual narratives. Lehmann Maupin prizes the distinct conceptual approaches that its artists offer on the essential matters that shape international culture today, including gender, class, religion, history, politics, and globalism. In 2013, with two locations in New York, significant interest in its artists abroad, and growth opportunities in new markets, Lehmann Maupin opened an additional location in Hong Kong, followed by Seoul in 2017. For more information on the gallery and its artists, visit www.lehmannmaupin.com.